After a 30 year career with the Federal Government, in 2004, Donna and her husband moved from Albuquerque, New Mexico to the home they purchased in Sequim in 1997. Always having a fondness for any animals, Donna knew she would get involved with them when she had more time. She volunteered with the Raptor Center and the Dungeness Court Alzheimer's home for six years, while also volunteering for OPHS. Most of her time began to gravitate toward the shelter and when she was invited to become a board member, she pulled away from the other organizations. 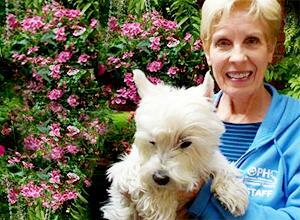 Donna shares, "The work I do on behalf of homeless animals is very rewarding and means so much to me. I plan to continue volunteering with the shelter for as long as I can be of service." Joshua is Donna's 13-year-old West Highland White Terrier. He was born in Bliss, Idaho and at the age of 8 weeks, Donna and her husband consider themselves lucky to have found Joshua's breeder on their move to Sequim. "Joshua is our second Westie and is a fun, joyful dog. He is the love of our lives. We will always have a dog and, perhaps the next time around, one of the lovely shelter dogs can share our lives."